Just a quick note to tell you I'm on the road and having trouble getting online to add to the blog. This would be a great time for any of you who are still interested to add me to your RSS or Feedburner, then you'll know as soon as i'm able to type up a full report on my adventures. Looking out of the window, towards my my sit spot at the far end of the garden, it's really high time I got to digging over the garden to plant a vegetable patch. Last summers apple crop was massive, but our month in France came at the right time for us but the wrong time for effective harvesting. We left unripe apples on the tree and returned to overripe wind falls on the ground. apples aside this year I want to get into it a bit more than last summers tomatoes and chills on the kitchen window sill. 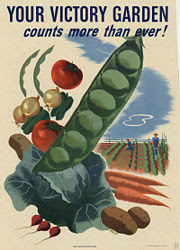 During the second world war the efforts people could make at home were a valuable source of both morale and nutrition. The concept was sold to the public as 'doing our bit' on 'the home front'. The project proved to me a huge success - the British haven't been as health since! A fact that's always worth pointing out to fatties when they moan 'its my genes' - the nation had pretty much same genes '39 through '46 as we do today but the availability of processed foods was massively restricted by rationing. So people grew their own vegetables and hunted rabbits, hares and pigeons with a previously unknown vigour and were healthier and slimmer. I once read an interesting account of a German woman's post war experiences in Berlin, after the war food and pets were thin on the ground. She said she became something of a local celebrity due to her skill at trapping! Oh and she confirmed, dog is a lot better eating than cat. The climate change, food miles, rising food prices, and city air quality issues (lets gloss over my need for mass reduction)are compelling reasons to take up a little suburban smallholding. Could I really live in the suburbs by the estuary, on garden grown veg, and the proceeds of shotgun, rod and ferret? I've added a historical blogs section to my blog roll, having taken great delight in reading Thoreau's Journal I thought it should be the first to appear. I saw this internet petition on Aktoman's blog and thought I'd sign up and ask you to consider doing the same. If you're in Blighty or are an expat please take a moment to sign your name to this petition.It is important that we win back any and all of the liberty's that we've seen eroded over the last few years. 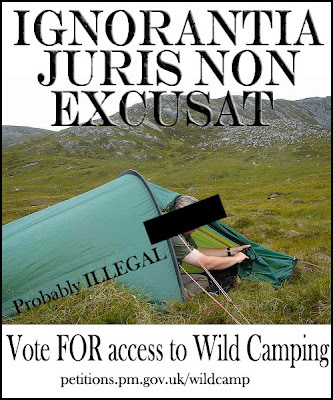 We the undersigned petition the Prime Minister to legalise wild camping in England and Wales. I'm not sure it will do any good, but as a point of principle I feel we should make an effort to be heard as its us who will lose out if we don't make the effort now. Witch Blades? Nice Work If You Can Get It! As you know I usually shy away from the 'draw queen' end of the knife making world. But rules as they say are made to be bent until they're broken. Having done a bit of school boy forge work myself in the past, I'm a huge admirer of the work these guys do, but fear of loss or damage, and the kind of money that they have to charge for the time they put in, stops me from buying this kind of tool. Somewhere along the way, surfing the internet, I came across witchblades where the design ethic sits so perfectly between 'artisan recycler' and the 'serious craftsman' that I thought I'd share it with you. 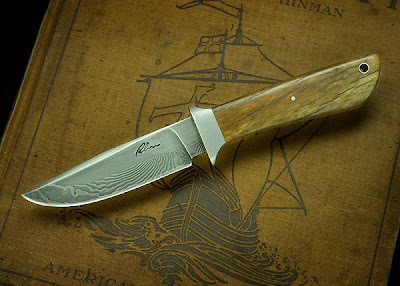 The top half of the blade is from an old railroad spike and the cutting edge is made from a Damascus steel that the maker Rik Palm beat, twisted, and wielded himself. Rik has published some pictures of the process here and some excellent pictures of what it takes to make Damascus here.Have a look at the gallery where there are too many neat design ideas to shake a stick at. 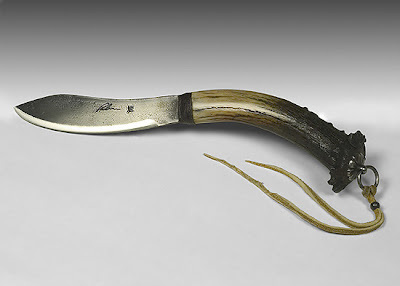 I particularly like the maggot knife and this totally authentic Nessmuk, with it's blade forged from an old file. Without wishing to sound like some new age loon claiming to 'channel' the spirit of bushcraft's grand old man of letters, I reckon it's pretty much what the old chap would have been looking at when he did those drawings of his perfect camp knife. I've recently added a new voice to my blog roll. Upland Feathers is a site dedicated to the thrills and spills of bird hunting on the other side of the pond. Robert (half of the husband and wife team who put it together), says it's 'for sporting adventurers who have a passion for grouse, pheasant, quail, woodcock, and wild turkey hunting'. Here in blighty the game bird season has just finished, (the pigeon season never ends) and doesn't start again until the autumn (fall). I was hoping (PLEAEEEESE BABY) to get back to South Dakota this summer to take on the challenge of Ringnecks. If (yes dear 'when') that plan fails I'm hoping to get back to the eastern US later in the year to hunt that legendary American game bird, the turkey. That's how I came to have read Upland Feathers. The sites a very useful clearing house of information for the visiting hunter.Featuring Where-to hunt on public lands - Public Lands! there is NO PUBLIC LAND in the UK. NONE. They also introduced me to the term 'Unboxing' which is basically the joy of taking new gear out of the box - and who doesn't love that? They follow it up too with 'In the field' gear tests and reviews the services of the guides, lodges and outfitters who can put a trip together for you. Interestingly they cover the political climate for hunters by keeping up to speed with the latest regulations from state and federal wildlife agencies and the local habitat Conservation programs. Really 100 posts already! 50 seemed like a lot. I thought I'd mark the occasion by giving some long overdue thanks to the people who have encouraged me along the way. Starting a blog is very easy, actually 'blogging' is a little more challenging. To start with it was just me mumbling into cyberspace. Then all of a sudden people started to comment, best of all it was people whose work I've enjoyed reading.To say I was delighted is such an understatement. Your comments and emails have made the blog so much fun for me to write, and I hope fun for you to read too. I really like reading your blog and was SO delighted when you commented on my first post. I'd been reading your stuff for a while, your comment was all the encouragement I needed. Mrs L AKA Lucy: I was a really great surprise to see that you were actually reading the blog. You're a voracious reader and can actually write yourself. meant a lot when you commented.lets get that camping trip together soon. Wow I exist, Rex from the deer camp knows I'm blogging! I was really blown away that you'd read my outpourings. SBW Compared to Ray Mears, you're too kind, I was a fan of your blog and then you commented! You gave me another of those 'I've arrived - someone's listening' moments. I'd followed your posts on BCUK for ages I was made up that you liked the blog. Thanks. You've posted some great posts and your comment was so apt. I love telling people about your blog, their assumptions are written all over their faces, hilarious! I still think you have the most unique voice of any of the blogs. Another milestone, i had no idea my blog was reaching so far. thanks for commenting. What can i say? Without your efforts so many people wouldn't have connected. By founding the Outdoor Bloggers Summit you've done more to promote writing about outdoor adventures than anyone. Massive thanks. Another 'I exist' moment, I'd been reading your blogs for ages and there you were reading mine! Really glad to see you posting again. Thanks for your kind words. You will forever be my favourite blogger. When you said I was an inspiration in starting your blog, well let's just say I had to buy a new hat! Thanks. I've enjoyed you blog immensely, cant say I'm not a little disappointed that you moved to the backyard smithy. PS you intro to the rasch chronicles was inspired! I've really found your blog useful, and was very flattered that you liked mine, thanks. You sir are a living legend. I've really enjoyed our conversations,no one can hold a candle to you for enthusiasm. What can I say hank you're my wild food hero! Thanks for letting me know your thoughts! Glad you like it - tell your friends! Bruv - how many posts did it take before you commented? Great blog man! thanks for stopping by. Thanks for dropping by - I'm pleased you've started your blog its good. James you deserve special thanks for services to Suburban Bushwacking. 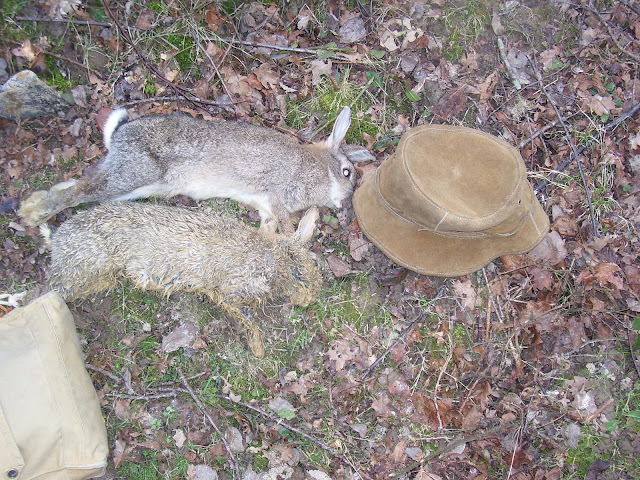 As I'm sure you noticed I really liked the rabbit hunt. See you soon. If you've given me a mention on your site or blog and I've not reciprocated is most likely that its because technorati hasn't listed you yet - so drop me a line. After three changes of train due to engineering works I was finally on my way to meet James for a spot of old-school rabbit hunting. With Ferrets. And what a great way to spend the day it is,James and Sara met me at the station and we drove through the Sussex countryside. For readers in the US - it looks just like the farmed parts of my adopted home of Northern Virginia, except the roads are narrower and the cars are smaller. James's dad's place is big enough to have several warrens all in different states of occupation. The biggest coney conurbation we investigated had been flooded out by the recent rains and was unoccupied. Of the five warrens we tried, two yielded a total of three bunnies. 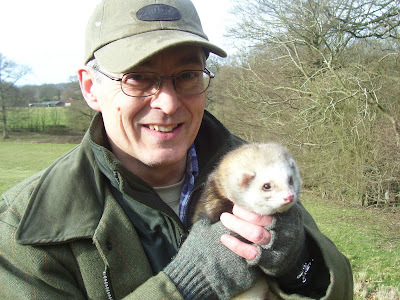 The Ferrets are charming, they have an animated curiosity about them and while I'm sure rabbits view them as dangerous thugs, to me they look very pet-like and from what I've been reading are easy to keep as companions and hunters. Here in the UK their role in feeding a hungry nation is quite well documented with references in court papers going back at least as far as the twelfth century when a ferreter was listed as part of the Royal Court. 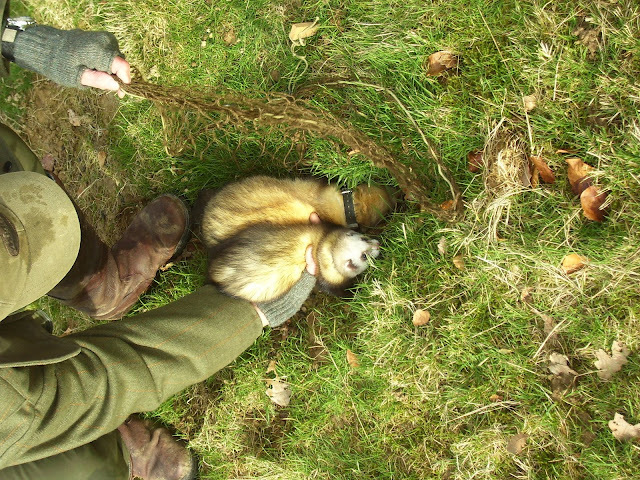 Today Ferrets ownership and hunting counjours up an images of working class countrymen in flat caps and long coats (to hide the booty) with bulging trousers using them for poaching for the pot or pest control for the land owner but it wasn't always the case. In the 1300's you'd have needed an annual income of some forty shillings (I'm not exactly sure of the exchange rate - but it was quite a lot of money) to own a ferret and the penalty for unlicensed ownership would have been harsh. 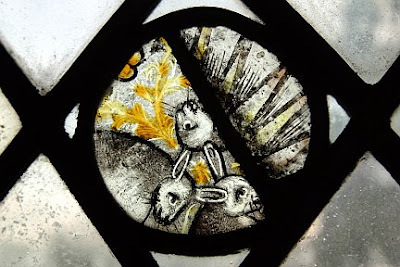 King Richard II issued a decree in 1384 allowing one of his clerks to hunt rabbits with ferrets and they're mentioned again in 1390 with a law prohibiting the use of ferrets on Sunday when feeding your family wouldn't be allowed to interfere with marshal archery practice. Ferreting is very simple, at the end of the afternoon I asked James if there was anything more I needed to know and he replied 'that's about it'. First you need a business of ferrets, two seems to be the preferred number. I'd recently read that one male one female was considered the best ratio, with males being more aggressive and females being more through, James reckoned that whatever you had would do at a pinch. We used the modern locator collars which certainly made things a lot easier when it cam to the digging. In days gone by you'd have had to tie a tread to your Ferret and let it pay out as the Ferret went down the hole, when the Ferret stopped taking line you'd know that it had either killed a rabbit and was taking a nap (something they're notorious for), or it had backed the bunny into a hole with no exit and wasn't letting it out. Either way it would be time to start digging along the tread until you got to the action. With a locator you're spared a hell of a lot of digging as you can find the spot from above ground and dig directly down. In the wet clay laden soil it's still hard work. If your lucky and it all goes according to plan, you've put you ferrets into the right holes the rabbits bolt out of the warren into 'purse' nets that you've secured over the exits. As the rabbit barrels into the net it's own momentum pulls the drawstring tight capturing it. These bolted bunnies are the most highly prized as without teeth marks from the Ferrets their flesh is untainted by coagulating blood and the make slightly less gamey eating. On the subject of eating special thanks and a commendation must go to Janet (james's mum) for the huge, hearty country lunch she served us that kept out the cold and the AMAZING bread and butter pudding she made. James has posted a video of our hunt here. As Ferrets usually come in pairs, they offer up some amusing naming opportunities. James had a pair called Dead and Buried and a lad called Robin who lives in Scotland and has a Ferreting blog calls his business Purdey and Kalashnikov! S. 'where are they? in a shed in the garden? She scuttled off dragging young R behind her leaving me wondering is she still speaking to us or are we now a family of evil rabbit killing hillbillys? PS If your interested in getting started yourself Deben have a DVD, sell the locator collars and net making kits. Have a look at his fascinating site about the motif and it's appearance in medieval art across the world.